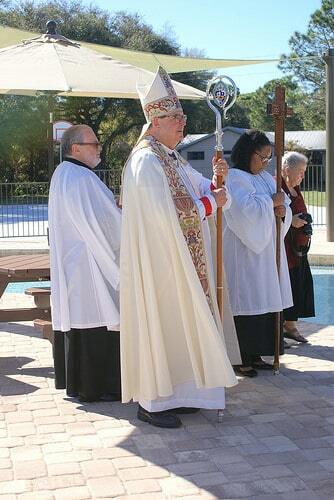 150 representatives from across Southwest Florida came to DaySpring Episcopal Center on Sunday, Feb. 26, 2017 to dedicate the new diocesan Program Center and Pool. The building is the completion of the first phase of improvements to the diocesan camp and conference center which broke ground in 2016. The dedication service, which included the sprinkling of holy water around the building, in the pool, and in the classrooms and large gathering room, referenced the Old Testament’s 1 Kings 8, where Solomon faced the altar in the Temple and celebrated the promises made to King David by God in the construction in Jerusalem. The 12,500-square-foot center, which blends into the rustic old Florida surroundings of DaySpring, is now the center’s primary facility for youth and adult programs, art, music, recreation activities, retreats, teaching and worship. While available to all DaySpring guests, the center is central to the growing Episcopal youth program at DaySpring, which has doubled its offerings to diocesan youth in the last two years. Participating in the dedication were counselors and youth team members, who took to basketball and volleyball after the service.